Syndicate Room is a brand new cafe at Sandringham, have to be honest this is the first time I stopped by at the area. It's less than 5 minutes from Southland and with plenty of parking space in front of the cafe. The decor is bright and modern which I love. When I first came in, I already what I want. They focus on taro dishes and I know I have to order a couple of them. But first, a couple of refreshing drinks such as fresh orange juice, matcha latte, taro latte and iced tea cause it was so hot that day. We wanted their pork belly but there was a technical difficulty so we have to change it to egg benedict. It has perfect egg, super generous and creamy hollandaise, we love it. It's just a classic dish, ham benedict. Because they have so many tempting sweet dishes, we ordered two of them; Taro Pancake and Taro Pannacotta. Both has taro flavour but the pancake has a subtle taste and the pannacotta has stronger taste. 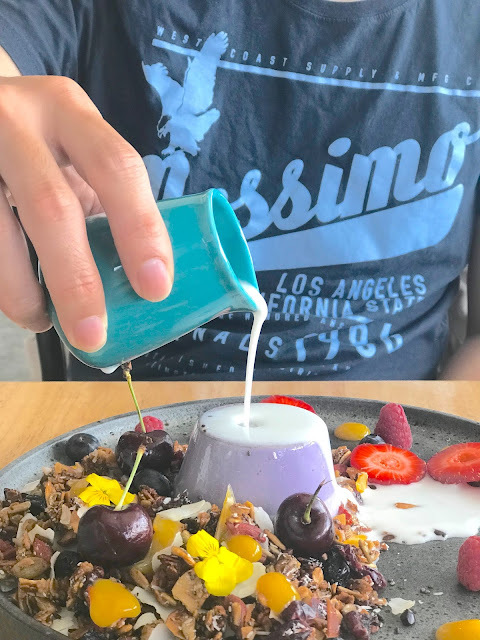 They comes in a very generous size, one of the biggest pannacotta I have ever served, they also put overly generous granolla and fresh fruit in it. My fave is their taro pancake, so fluffy and soft with light taste of taro, perfectly partnered with everything that comes in the plate.